Here's How You Can Easily Keep Your Kid's Room Tidy & Super Organized! Sick and tired of watching toys lying everywhere on the floor of your kid's room? Looking for a more "versatile" solution to your organizational problems? Well, then, our stuffed animal bean bag is the perfect solution for you...and your child! Just fill the bean bag cover with your kid's stuffed animals, teddy bears, plush toys or even pillows, blankets and towels and then use the bean bag as a comfy chair for the nursery! The bag itself is 38'' which means it can hold up to 90 various sized stuffed animals and be a comfortable seat for your kids, even as they grow up! Quality That Will Make An Impression! Our beanbag chair/ottoman/pouf is made with premium quality canvas that is extremely strong for maximum durability. Plus, the canvas bean bag will stay in perfection condition no matter how "active" your kids are and regardless of how often you wash it. And yes, it is machine washable for your own convenience! Our beanbag is made with sturdy thread and dense double stitching, resulting in zero fear of tearing or ripping apart. Plus, we have used YKK long zipper which is known for its heavy-duty and long-lasting quality! Did your beanbag get accidentally torn? No worries! As long as the insert is not over 32'' in diameter, we'll send you a new one! Not 100% happy with your order for ANY other reason? Your beanbag stuffed seat is covered under our 2-YEAR WARRANTY! Scroll Up, Click 'Add To Cart' And Get Yours TODAY Before We Run Out Of Stock Again! A MUST-HAVE FOR EVERY KID'S ROOM! - Our stuffed animal bean bag is a 2-in-1 parent AND child essential, since it can be great for storing your kid's plush toys and also makes for a cute and comfortable pouf seat for your child! Just organize away the stuffed animals, towels, blankets, quilts, pillows and everything you need to tidy up the room in seconds!  MADE TO LAST FOR YEARS! 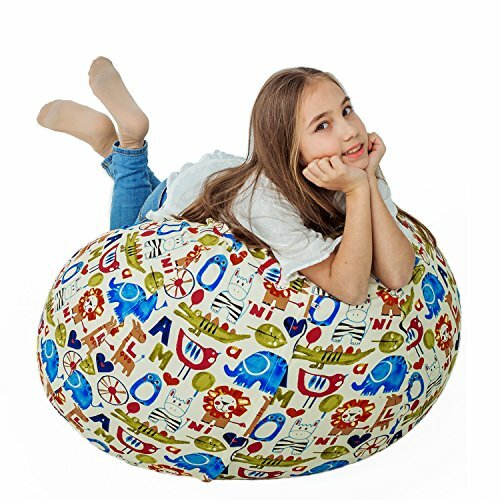 - Designed with strong cotton canvas, this stuffed toy bean bag seat is very durable for maximum performance! In fact, it features a quality long zipper and dense double stitching so you can count on it NOT getting torn or ripped for a very long time to come! A STYLISH ADDITION TO YOUR KID'S ROOM! - Our plush toy storing bag is just perfect for both boys and girls as it comes in a playful, colorful AND machine washable design, making it the most stylish and convenient addition to every kid's room or nursery! AN INSTANT MOM & CHILD FAVORITE! - Just think about it! This plush bean bag will help you organize your child's room in seconds, plus, it's extremely easy to wash without any color fading or fabric ripping. Plus, your kids will be extremely happy, owning a comfortable seat while they're relaxing with the family or having fun on their own! LOVE IT OR YOUR MONEY BACK! - We invite you to give our XXL stuffed animal bean bag a try and if you or your kid are not 110% thrilled with it for ANY reason, just get in touch with us and we'll make it right. After all, your purchase is covered under our 2-YEAR Refund Or Replacement WARRANTY for your complete peace of mind! If you have any questions about this product by BOF Creations, contact us by completing and submitting the form below. If you are looking for a specif part number, please include it with your message.